Converse to magnetism, in life, like objects tend to attract like objects. Good attracts good that the same way bad can attract bad. Trips to the doctor beget trips to the hospital and so on. Have you ever heard the expression that the more money you have, the more money you’ll make? That’s because money also attracts more money. Pay attention to the thoughts you have right now. Are they good thoughts or bad thoughts? Are they thoughts of growth and improvement or limiting thoughts or thoughts of despair. How do we know what thoughts in our head are true and which ones we just placed there? Just because you have a thought in your head, doesn’t mean it’s true. If you follow this thought out a little further you can see that if your thoughts are not true, then you can place thoughts there that are more fitting to your desired outcome. Some self-help books call this “self talk”. Some people view this as lying to yourself. I am proposing that your mind is always lying to yourself, so why not use the thoughts that it is telling you for good instead of detriment? 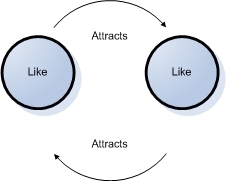 Let’s take a moment to go back to the thought about like attracting like and view some specific examples in science, nature, and in social settings. If you grab a glass of water, then drop some oil in it, watch as the oil at first dissipates, then collects back together as the molecules are more attracted to each other than to the water. Now, go outside, find a lake or pond and watch as the fish congregate together or how the “birds of a feather flock together”. And lastly, visit a high school cafeteria and see how the children naturally segregate into various groups among the tables. It’s the same way with adults and in life. Rich people are more comfortable hanging around rich people. Poor people are more comfortable hanging around poor people. It’s not that they can’t or don’t mix, but there is a level of uncomfortableness with this mixing. I’ll be discussing comfortableness in a following post, but for right now I just want you to see how like objects are naturally attracted to like objects. Now that you can see how it is naturally occurring, can you see how money naturally attracts more money? Let me give you some practical examples by starting with nothing. A man goes out and offers his services in return for pay. This person is now considered experienced at what he does and can advertise this fact in either a resume or in an advertisement. The man is now able to offer his service for a higher pay or in higher volume, thereby making more money. This is active income, but if he manages his money well, the money will begin accruing passive income through savings and investments. This man has now gone from having nothing to having something by doing one thing well and attracting more of it. You may have heard of Dave Ramsey’s debt snowball. Well the snowball is an example of like attracting like. Paying down debt begets paying down more debt. And once the debt is gone, the snowball can then turn into a snowball that instead of “beating debt” begins to “build wealth,” as Dave would say. I highly encourage you to check out Dave Ramsey’s books. They have helped many people create a plan for how to get control of your personal finances. Dave likes to say that if you don’t manage your money, your money will leave you. This is akin to the idea of what you don’t manage, you don’t value, which is what I recently blogged about in The Law of Focus. The Law of Focus is much about like attracting like. Because you are focusing on something, measuring it, and valuing it, when you come across more of it, you will collect it or because you are so fond of it, others will bring it to you. This could be in the form of more work or just word of mouth (free advertising). For example, just like in the story of the man who had nothing and began offering up services, once you start down a path, people around you notice your path, and start to help make it straight for you. This is only natural. For those who don’t know which path to go down, that is the subject of a future blog post.